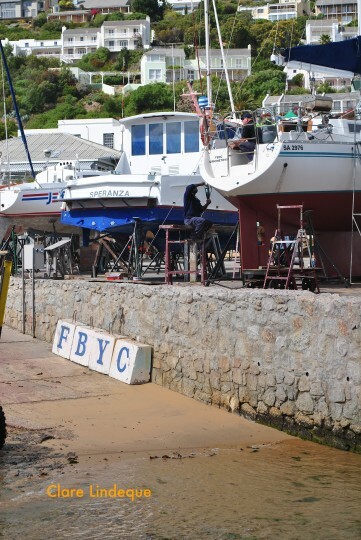 False Bay Yacht Club is located between Long Beach, Simon’s Town, and Miller’s Point. 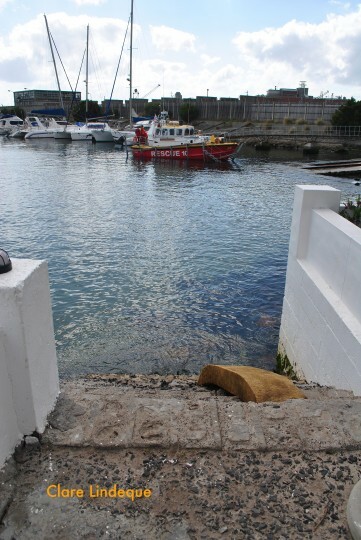 There is a slipway there, but in order to gain access (to it or the club) you will need to be a member or take out a temporary membership. 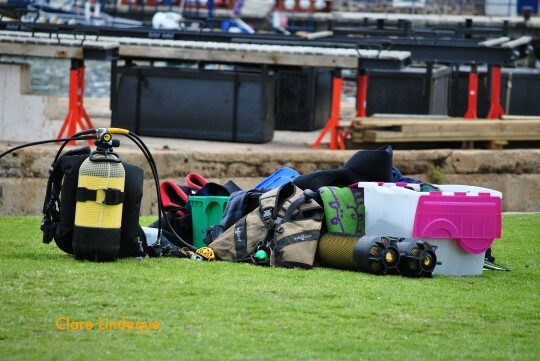 The facilities are pleasant with a very cheap restaurant, grassy areas to relax on, and access to the yacht basin, which is sometimes used when conditions at Long Beach are too dire but dives have to be done. This is easy. Keep on the Main Road through all the coastal suburbs – Muizenberg, St James, Kalk Bay, Fish Hoek. At the circle at the top of Fish Hoek Main Road, keep left and stay next to the sea. You are basically following the railway line along the coast. Carry on through Glencairn, and into Simon’s Town. You will drive down a short hill, next to a stone wall with navy barracks on your right, and a Shell garage. There will be an entrance to the touristy Old Town Pier harbour area on your left, where Bertha’s is. Drive past. Look out for the shady parking area coming up on your left, where the Just Nuisance statue is. Just after the parking area look out for the white i in a green circle indicating Tourist Information. Drive on by. When you see a long stone wall on your right, start looking on your left for a brown Parking sign saying Martello Road/Cole Point and beneath it a sign for the local NSRI Station. Turn left at the signs, and follow the road as it bends left into a small parking area. The parking can get very crowded on busy days. The entrance to the yacht club is at the end of the parking area. When you get to the end of the M3, turn right at the traffic light and contine through one more set of lights (Virgin Active on your right). Just before the next set of lights take the slipway to the left, up onto Ou Kaapse Weg. This turnoff is not well signposted! Now you basically stay on the same road until it ends abruptly in the ocean. Go over Ou Kaapse Weg into Sun Valley. Continue straight through two sets of traffic lights (stopping if they’re red), onto the Glencairn Expressway (Blackhill Road). This takes you over a small mountain into Glencairn. When you get to the sea, with a Spar on your left and a wetland on your right, turn right. Now you are on the Main Road. Directions continue as from Item 3 in the Main Road section above!